Want to reconnect with someone? How about track down a long-lost classmate, a friend you just lost contact with, or even look up your genealogy? You can do all this and more with free tools found online. Have an open Word document or Notepad tab handy to keep track of your information. You will not find everything you are looking for in one place; that's why we always suggest that you use a wide variety of sites and tools in order to find all the information that is possibly available to you. Put together as much information as you have on the person you're looking for first. Do you have an address? Last name? Date of birth, date of death? These are all tidbits of information that will greatly aid in your search. Use as many different sources as possible. It is virtually impossible to find everything you're looking for from one source. In order to get the best array of information, it's imperative that you use as many sources as you can. One of the first places you'll want to go when trying to find someone online is Zabasearch. Type the person's full name into the search field, and see what comes up. You most likely will get a lot of information here, but do not pay for information. If you see something that asks you to pay, just disregard it. You'll be able to obtain a good amount of absolutely free information here on the person you are looking for - or at least enough to keep going. Once you have your information, copy and paste it into a Word document or Notepad file for easy access, and keep on going to the next step in this list. 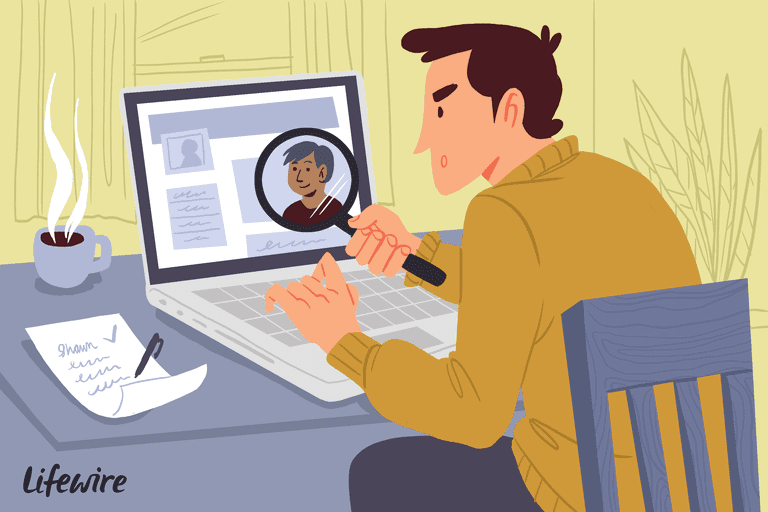 In order to find someone on the Web, you're going to need all your sleuthing skills - very rarely does all the information you're looking for come to you in one search. That's where Google comes in. The behemoth search engine tracks everything users search for and provide; some people call it spying while others call it smart business. Regardless, the information can help you immensely if you know where to look. You can use this article on Google People Search for specific Google tips that will help you find who you're looking for with this popular search engine. For instance, merely typing the person's full name in quotations - "John Smith" - into Google's search field can potentially yield quite a few favorable results. If you know where the person lives - "John Smith" Atlanta - you'll get even more results. How about where the person works? "John Smith" "coca-cola" Atlanta. Facebook is one of the largest social networking sites on the Web - and there is a very good chance that the person you are looking for has a profile there. Pipl is a people-specific search engine that gives you information that's a bit different than what you'll find using Google or Yahoo because it searches the invisible Web, otherwise known as the information that's not readily accessible in a cursory Web search. Type in the person's name that you're looking for in the Pipl search box, and see what you come up with. Obituaries can be relatively simple to track down, or they can require a lot of research both on the Web and off. It just depends on when and where they were published. However, you can use the Web to find many obituaries online for free, or, at least get started on your research. These are some of the best free public record search databases online, from obituaries to census records. Depending on the state or country that you live in, you might not be able to access more personal public records, such as birth certificates, drivers' licenses, marriage certificates, etc., without A)showing physical proof of identification or B)paying a fee. Many of these resources give you a good starting point from which to begin your research. ZoomInfo takes searching for people on the Web to a whole new level; by using a combination of various technologies to crawl the Web (Web sites, press releases, electronic news services, SEC filings, etc. ), ZoomInfo organizes all the information about people into a readable, sensible format - profiles that can also be searched within ZoomInfo by corporate headhunters. Type in who you're looking for into ZoomInfo and you'll potentially come back with a lot of information that leads to other information: i.e., links that show you where else that person is on the Web (that's IF they have a presence online. If the person you are looking for doesn't get on the Web much, this isn't going to do you much good.). If the person you're looking for has done anything on the Web, PeekYou should be able to pick it up. For example, Peekyou enables you to search for usernames across a variety of social networking communities. For instance: say you would like to learn more about the person who uses the handle "I-Love-Kittens"; you can use PeekYou to see what else they might be doing on the Web under that username (most people use the same username across many different Web services. If you know the person's name that you're looking for, type it into the LinkedIn search box and you'll get information such as current job, professional affiliations, and more. If you're lucky, you'll be able to find a LOT of information on LinkedIn, and you'll be able to use that information, in turn, to keep going in your people search. Every little bit counts. If you have an address, you can find out a lot about your person's home at Zillow. Just type in an address, a general area, or a zip code, and Zillow returns a plethora of real estate information about your query. In addition, you'll also be able to see how much that person's house has been valued at, houses in the surrounding areas, local resources, and more.